For FULL SCREEN view of before/after photos below "click" button on far right at bottom of image. Photo 1. Before Atlas position correction. She complained of low back pain (especially on the right), and right leg pain. Photo 2. After Atlas position correction. Photo 3. After ASTYM treatment (see petechiae: tiny red spots of blood). What are myofascial meridians and how can this innovative way of viewing the body's anatomy help us alleviate a painful condition? 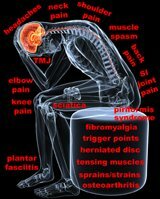 It helps us "see" the cause and effects that contribute to a pain condition. But more importantly, it gives us a new set of conservative treatment options. "Seeing things more clearly..." Perhaps this is the goal of many doctors when they examine a patient and prescribe a specific treatment plan. So, diagnostic equipment has been developed to "see" what is happening on the inside. Those who practice medicine look at individual parts to identify why you are having a symptom. In this way, a medical doctor hopes to identify the exact body part that the problem resides in and then attempt to fix that part. We get labeled with one particular diagnosis or another, so the doctor knows what to expect and whether it is something that can be treated with a pill, a procedure, or surgury. Your doctor says: "The MRI shows you have a disc bulge that is pressing against your spinal cord (or against a nerve as it leaves the spine). Therefore you need a spinal surgery in order to fix this defect." Or, you may have been told that you have arthritis and therefore you will always have pain. Your x-rays show degenerative changes in the joint surfaces and pain will continue until you have this fixed with a surgery, but until then here are some pain meds to help you deal with the pain. Thomas Myers' ground-breaking concept of myofascial meridians as described in the textbook, Anatomy Trains, 2nd Edition, exposes and explains the clinically relevant myofascial links that transmit strain and tension body-wide, creating global postural patterns. Using these concepts make other myofascial technique more effective, especially in treating chronic pain. Understanding this innovative way of looking at anatomy makes our treatment methods more precise. Techniques like ASTM or ASTYM or Graston Technique or Gua Sha, are much more effective because we see more clearly what areas of the body need treatment. What does this mean? It means that we have a more holistic yet precise approach when we perform a myofascial technique. Watching the following videos will introduce you to how myofascial meridians or fascia lines have enhance my treatment strategies, especially with chronic problems. This video helps to descibe some of his profound ideas on how the body functions like a sail boat not a crane.